Greek Heroes Set is one of the legendary armors in Assassin’s Creed Odyssey. It’s one of the best looking outfits, and each part supposedly comes from a different mythological figure. Wearing the entire set will make you look awe-inspiring, and it will increase your resistances. It’s also one of the most difficult sets to acquire, as it takes a lot of work. 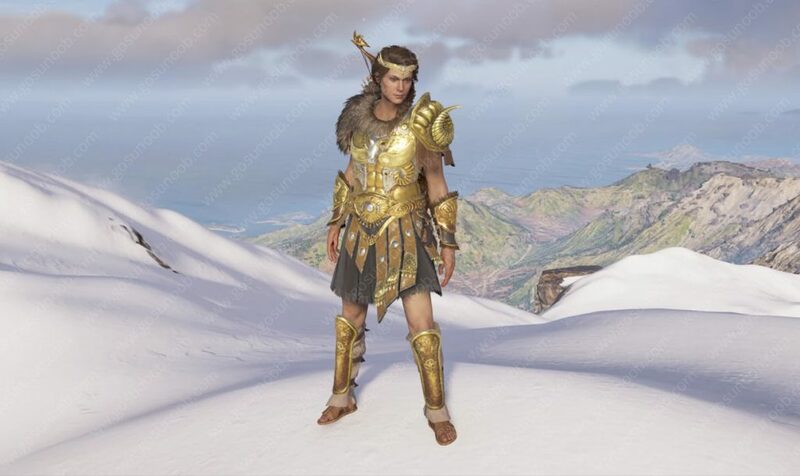 This guide will help you get the AC Odyssey legendary armor Greek Heroes set, as well as show you what it looks like and what its set bonus is. How to get Greek Heroes set in AC Odyssey? In order to obtain the entire set, you’ll have to defeat a certain number of mercenary bounty hunter. Since they are semi-random, here’s what you need to do – open up the mercenary menu and inspect them all one by one. The game will tell you which ones will drop pieces of the Greek Heroes set. Now that you know who they are, you just have to hunt them down using the tracking feature. Equipping all the pieces of this legendary armor set will grant you +20% to all resistances. The game doesn’t clarify whether this means just poison, fire and stuff like that, or does it cover regular slashing/blunt damage as well, but it’s a great bonus either way. Especially considering all the pieces have perks of their own as well. This legendary helmet is actually a tiara. Nothing wrong with that, especially as it’s a rather pretty tiara, with tiny horns and an inset precious get at the forehead. Apart from making you look like a princess, it will give you +15% warrior damage and +20% chance to ignore half damage. Granted, I’ve grown up in a city, but I’m pretty sure this is no fleece. It is remarkably swanky, though. The description says it’s made of gold, which kinda makes us doubt its efficiency, but it does have great stats despite that. One shoulder is covered in fur, the other is protected by a pauldron with a ram’s horn in relief. It will give you +15% warrior damage and +30% total armor. The bracers are made of fur and leather with metal plating for added protection. The plates have decorative etchings, too. When equipped they’ll buff the wearer by giving them +15% warrior damage and +10% health. The waist piece consists of a black cloth skirt, an insanely ornate metal belt and wide studde leather strips covering the thighs. When worn, it adds +15% warrior damage and +15% melee resistance. The sandals are pretty standard fare – they have metal shin guards that are mostly plain, with some engravings around the knees. If you decide to wear them, you’ll get +15% warrior damage and an additional +10% elemental resistance.